We are so grateful to Jamie Calaway for sharing her family’s story and how RMHCA has helped them! At 29 weeks gestation, my youngest son Jace weighed 1.8 ounces and an ultrasound revealed he had a hole in his heart and my placenta had stopped working properly. Jace and I were whisked off to Children’s Hospital in Jackson, Miss. where after a week in hospital bed rest and observation Jace was born at 30 weeks weight 1.8 ounces with a AV canal abnormality, Down Syndrome and prematurity. He spent three months in the NICU. We were three hours from home and Jace was one of six kids. At that time, my husband and I were fortunate enough that someone could open their home to us. 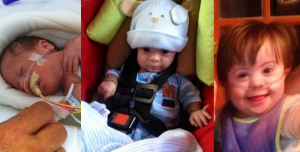 At 5-months-old, Jace went into respiratory failure. After three weeks on ventilator and much debate, Jace successfully had his AV canal repaired. This required eight weeks of hospitalization. Jace returned home with his family until Dec. 20, 2015. Jace was rushed to Children’s Hospital of Alabama for respiratory failure due to Respiratory syncytial virus (RSV) and human metapneumovirus. I stayed in ICU with Jace from December 2015 until August 2016, hardly ever leaving. Jace was fighting for his life. Every month for nine months Jace would go into full septic shock and I was told on numerous occasions to stop intervention because he would not make it out alive. I was also told if he would make it, he would have cognitive damage. Meanwhile, I had five other kids at home, one being a senior in high school. God sent me incredible people in my life that I did not know before this who could be with Jace while I would go home for all the special occasions. Life was hard for all of us. The stress of not being able to be with Jace and the other kids at the same time was unbearable. They all needed their mom. 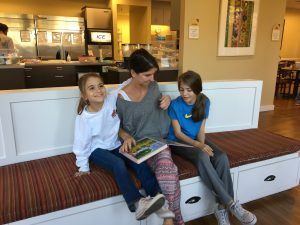 In August 2016 I decided to move my 3 younger kids – Josie, 9, Jade, 12, and Jax, 14 — to Birmingham to Ronald McDonald House Charities of Alabama. They stayed until February 2017. L-R: Josie, Jamie and Jade at the House. Here in Birmingham I became a part of an extended family. These people at the Ronald McDonald House take their jobs to heart. 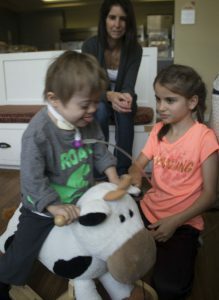 I don’t think I could ever truly explain what the Ronald McDonald House provided for me during a difficult time. The Ronald McDonald House was more than a place to put my head at night. Each individual person there became an extended part of my family. They really cared about me, my kids and our situation. The atmosphere at RMH not only exudes home, but almost the sense of coming home for the holidays. The meals that they organized, along with the outreach from the community to provide activities for the families all helped take our minds off the horrendous ordeals we are going through. 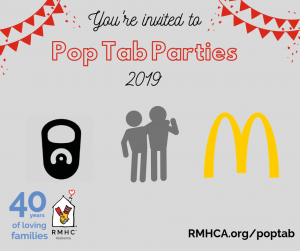 It would be hard to pick out one special thing that stuck out, because after being there for just a little bit, coming through the doors of Ronald McDonald House made the weight of the situation from the hospital fade away. There was always a smile, a hug, a comfort from the staff, always a willingness to listen, to laugh or to cry with you. I’ll remember the compassion that comes through every staff member there, from the maintenance and cleaning people to the front desk to the administrative staff in the back and also the volunteers. They really care about your situation and how they can support you through this time. They walk that extra mile. But what is extremely amazing about this house is the compassion that they have mixed with the professionalism and ability to adhere to boundaries is quite impressive. My kids got to blow off steam by the activities that were always available like ice skating, baseball games, the McWane Center, bingo and other random activities. L-R: Jace, Jamie and Josie play at the House. The sororities and college kids that came and spent time with my kids every week was priceless. I will never forget Halloween most of all. The costumes provided were for little kids but the staff made sure my girls had something age-appropriate and cool to wear. They really cared about their feelings. When it was time to be going home, it was a bittersweet feeling. It was a chapter I was glad to close but also sad to leave. They had become family as well as making the atmosphere where each individual family connected with each other. This is a place that I’m thankful for. I am grateful there are individuals out there that donate their time, energy and money to support Ronald McDonald House Charities of Alabama. Through your donations you help bring peace, support and strength during a difficult time. You help hold families together, giving them an opportunity to live life with routine and keep them together. The only thing I could ask to be different is that you would have space available for larger families. Thanks for all you do. You made a rough situation better and brought a lot of joy and fond memories. We hope that you enjoyed learning about Jace and his fighting spirit! Please help us support families just like the Calaways by donating or volunteering today!